We’ve all heard of the Paparazzi, the guys with cameras hounding celebrities, both real and self made, always in search of that elusive photograph that they can get exclusively. And then sell for thousands of dollars to appease the ever growing appetite of the adoring public. Not a job most of us would line up to do, I’d guess. Let’s instead ponder over the possibility of joining the ranks of the “Geikorazzi”. Just for a day. You’ll need the ubiquitous camera, of course, heaps of patience and lightning quick reflexes. And you’ll have to travel to Kyoto, Japan. For most people, Japan is still a land shrouded in mystery and esoteric culture. Nothing represents this more than that ubiquitous emblem of traditional Japanese culture – the geisha. 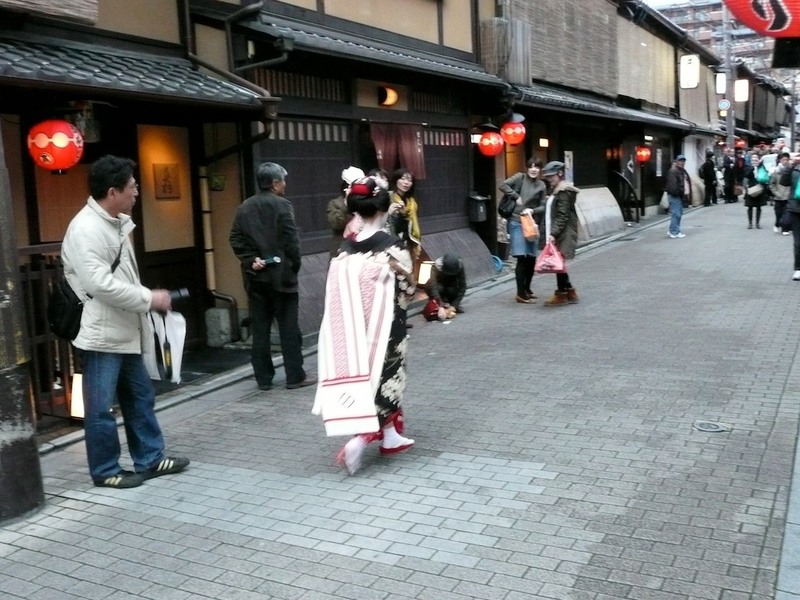 Seeing a geisha, garbed in full, ceremonial attire, is often the highlight of many visitors to Kyoto. This fact, coupled with the usual, and completely understandable reticence that they feel on being accosted on the streets, as well as the near impossibility of garnering an invitation to an actual geisha performance, means that for the average tourist to be able to catch a glimpse of geisha has to be something that is carefully engineered. A successful “sighting” will leave the visitor entranced at the opportunity to see these wonderful part of Japanese culture, as well as protect the privacy and dignity of the geisha themselves. Whilst they are such a poster child for the iconic imagery of Japan, there may be no more than 2000 geisha remaining and the number is fast declining. 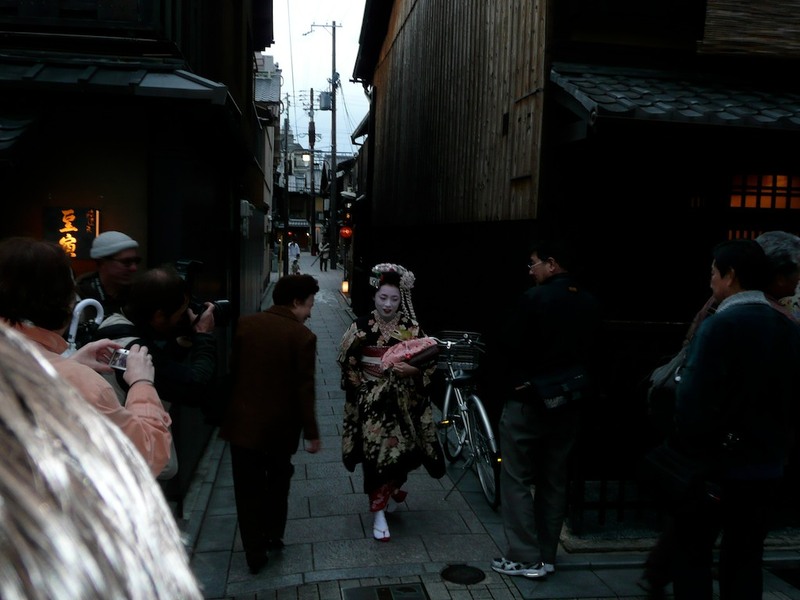 These two factors combined makes “geisha spotting” one of the must-dos on practically every tourist’s list for Japan. First things first, however. Geisha are not prostitutes. It is very important to understand this. Geisha, or geiko, as they are traditionally called in the Kyoto dialect, are performing artists trained in the arts of music, dance, conversation, and rituals like the tea ceremony. The very word “geisha” means “artist”. So don’t go getting any funny ideas. The only way to meet a geiko is by being invited to a private gathering at a ochaya or tea house or a ryotei, which is a traditional Japanese restaurant, for which privilege you have to pay the equivalent of hundreds of dollars. For us mere mortals, the best bet for catching a glimpse of these mystical beings is when they are heading to one of these parties. The ochaya are in the hanamachi, or flower towns, the traditional name given to the geisha districts. 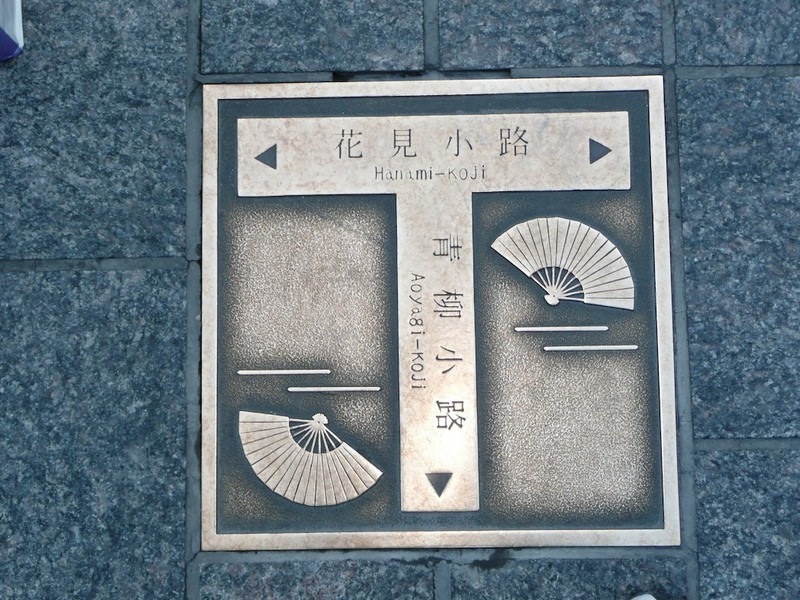 There are five main hanamachi in Kyoto. One is a narrow street called Pontocho-dori which is on the west side of the river. Two others are Kamishichiken and Miyagawacho. 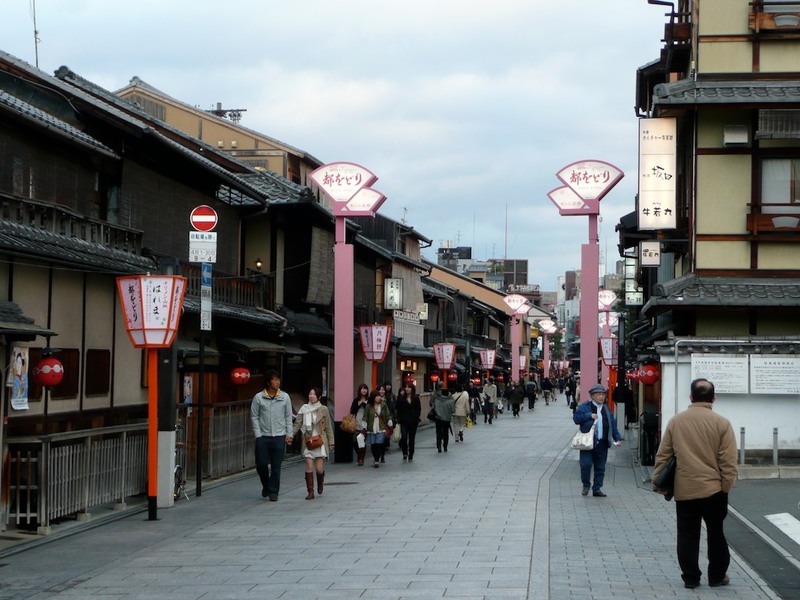 The two most popular ones are Gion Higashi and Gion Kobu in Gion, with Hanamikoji-dori being the most popular street, enhanced by its timeless architecture and otherworldly feel. This is where the geisha come, first to pray at some of the small temples and shrines in the neighbourhood, and then to the teahouses where they are working for the evening. You normally catch a glimpse of them as they are getting out of a taxi and walking the short distance to the entrance of the teahouse. When do I go ? Most geisha head out to work at around 5.45 in the evening. So you should be there, in position, so to speak, by about 5.15. Find a nice spot, walk around and check out the beautiful neighbourhood while you wait. What goes into a teahouse has to eventually come out as well, so you could also take your chances around midnight, when the geiko are heading back home form the tea houses. Pros – hardly any other Geikorazzi around at that time. Cons – miss out on the photogenic quality of the twilight shoot. And it can get very cold, if you happen to be there in the wrong season. What will I see ? 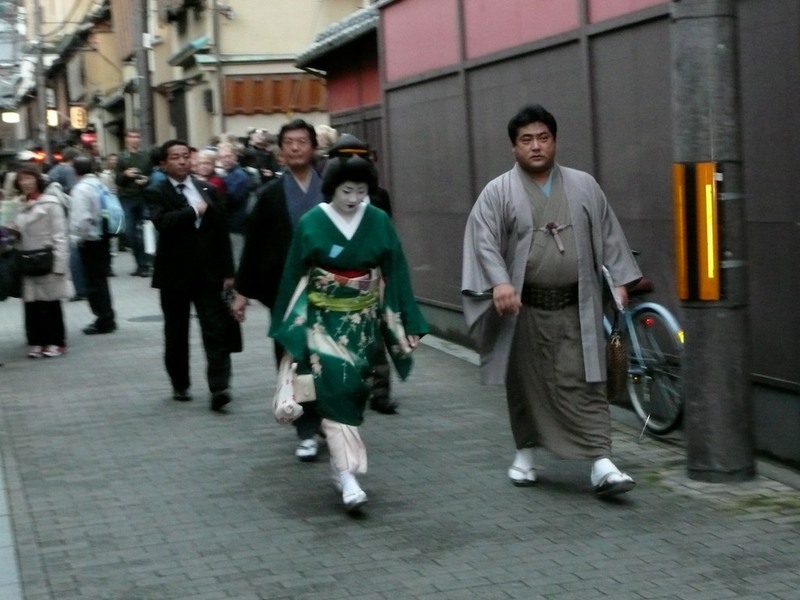 You with either see a geiko or a maiko heading in to work. A geiko is a full fledged geisha, and they tend to be more plainly dressed. A maiko is an apprentice geisha and they are usually more elaborately and ostentatiously dressed. If you see a very colourful kimono, an elaborate hairstyle with hair ornaments, its most likely that you are looking at a maiko. The kimono will usually be patterned and not plain, with an embellished obi, the belt used to tie the kimono around the waist, which may hang all the way to the ankles. 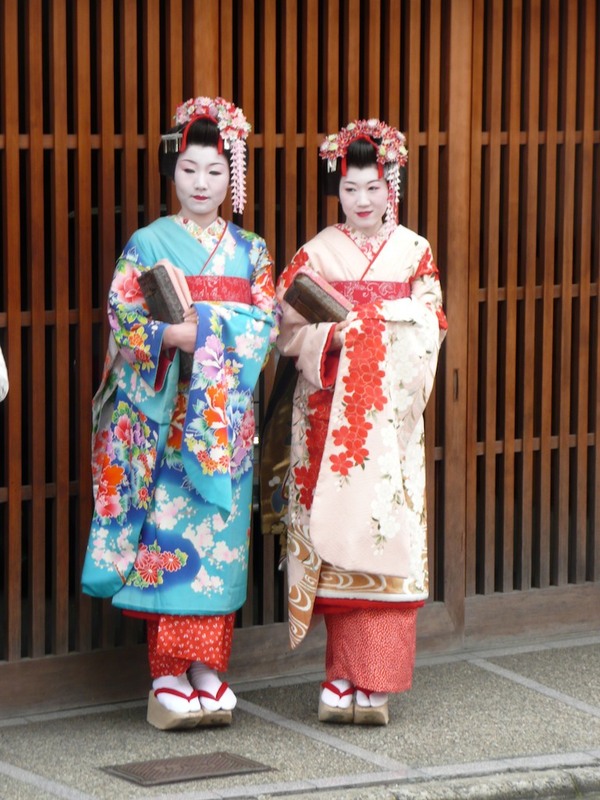 Maiko also tend to use the platform wooden footwear called okobo, while geiko usually are in in the flatter zori. Sometimes you may think you have seen geisha, but all you have seen is a Japanese tourist playing at “Geisha for a day”. 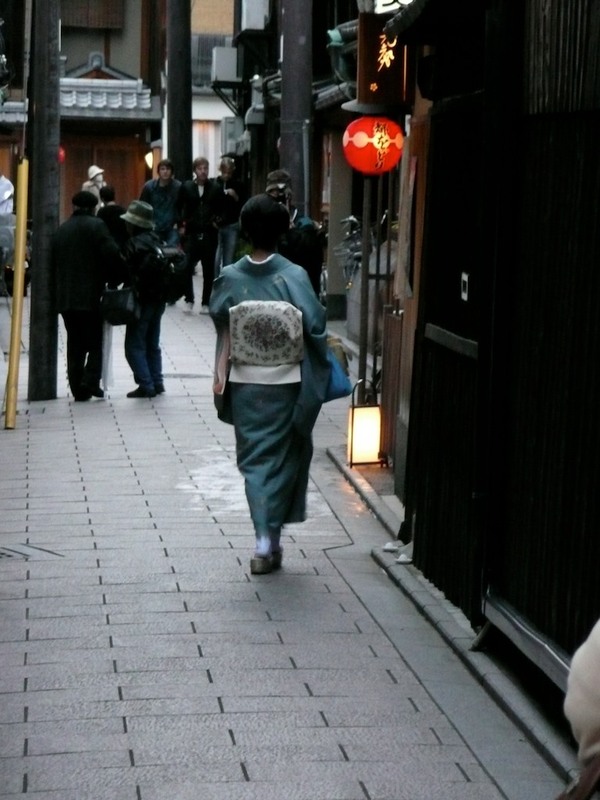 There are many places in Kyoto where Japanese women can dress up as geisha and walk around the town as part of their visiting Kyoto experience. How do you tell the difference ? Primarily from their behaviour. Real geisha do not stop, wait, or pose for photographs. Playing geisha dress up is not cheap, it can cost between 100-500 dollars. But the quality of the white make up used to cover the face is also a dead giveaway – a real geiko’s face will be smooth and refined. Keep a look out at the street corners because this is where taxis normally drop off geiko. Keep your camera ready and handy, and be prepared to take quick, candid shots. The geiko are very quick, even though they walk with small dainty steps, and they know that there are many people waiting to catch a glimpse of them, so they move very quickly. What should I not do ? Do not try and stop them to ask for a photo. They are on their way to work, and you have to respect that. Also, do not get in their way when you are trying to take a picture. The geiko know about the fascination a sighting holds for tourist, and they will not mind you taking discrete photos, but please do not invade their privacy. Don’t run after them like stampeding wildebeest. And under no circumstances should you try and touch them. What’s the best time to visit ? Kyoto has a couple of festivals during which it may be easier to orchestrate a geisha experience. Every December, on the day of the Kotohajime, which is the start of the New Year celebrations, geisha make it a point to visit all their teachers. They are likely to be more simply dressed but you should see more of them in Gion during this festival. Another occasion is the Kabuki festival called Kichirei Kaomise Kogyo which is also held in December at the Minami-Za Kabuki theatre, right next to the Gion subway exit. During this festival, all the hanamachi host their own special program called a soken, for geisha to attend. They do not perform at these soken, and are there just to attend, elaborately dressed for the occasion. Although the soken are public events, tickets are extremely difficult to come by. But again, the geisha have to get to and from the theatre, allowing for a good chance to see them if you position yourself near the theatre. Conversely, at the time of Obon, which is a Buddhist festival commemorating the ancestors, geisha do not work, and so the chances of spotting them dwindle considerably. Obon usually takes place mid-August every year. What if I have lots of money to spend? Even if you are willing to spend the hundreds of dollars required, you still need to be invited by a suitably placed high up connection to an evening at a tea house with a chance to meet a geiko face to face. Concierges in five star hotels in Kyoto and other luxury properties may be able to help with gaining access. A typical evening would involve dinner and meeting with a geiko with about a couple of hours of conversation, music and dance, and playing typical geisha games. What if I don’t have money, or patience ? 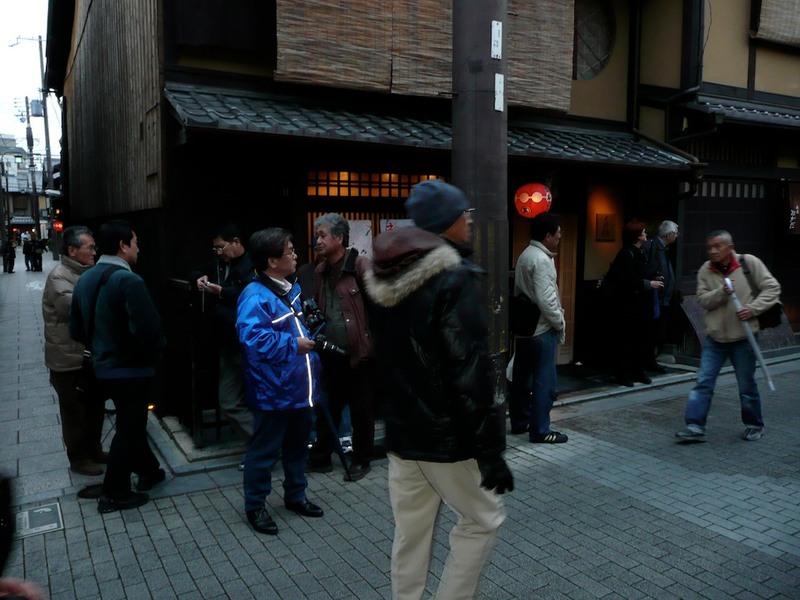 Your best bet will be to take in the 30 dollar tourist entertainment contrivance at Gion Corner. Tickets go on sale at 6.00 pm and the performance starts at 7.00 pm. The show is designed to highlight many traditional Japanese art forms so as to give tourist a taste of Japanese performing culture. About 10 minutes of the 1 hour show is dedicated to a geisha performance, which of course, is a far cry from the real deal. So there you have it. Geikorazzi 101. For most of us who practically abhor the idea of joining this particular breed of wildlife photographers, all I can say is, yes, it is what it is. You are invading another human being’s private space, you may also be guilty of objectifying and stereotyping them. But hopefully if you follow the guidelines above, you’ll encounter geisha in a way that is not offensive, either to the subject in question, or to yourself.